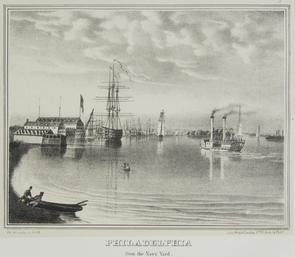 Lithograph of Navy Yard. Men in boats, steamship and sailing ships in harbor. Credit: On stone by J.C. Wild, Lith. of Wild & Chavalier, No. 72, Dock St., Phila. "Panorama and views of Philadelphia and its vicinity : embracing a collection of twenty views from paintings by J.C. Wild" Philadelphia : J.T. Bowen's Lithographic and Print Coloring Establishment, 1838.